Static tables waste space in the aisles. Tables on ActivRAC move along rails, doubling your grow area. Want to gain even more space? Go vertical! Spacesaver’s compact mobile systems consist of four main components. 1 Rails installed in or on top of the floor. 2 “Carriages” that move along the rails. 3 Tray area with industry standard sizes compatible with lighting and irrigation systems. 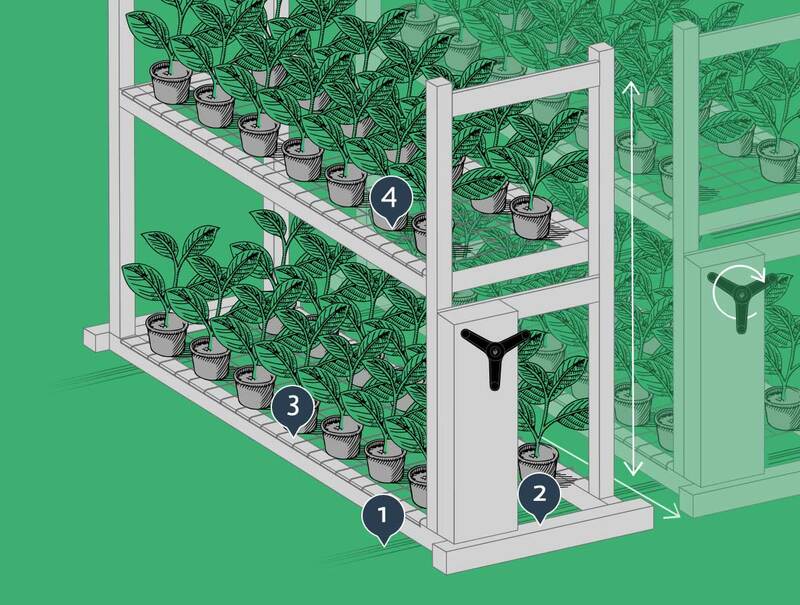 4 Vertical Racking to fully maximize grow space with up to four tiers of trays or shelving. 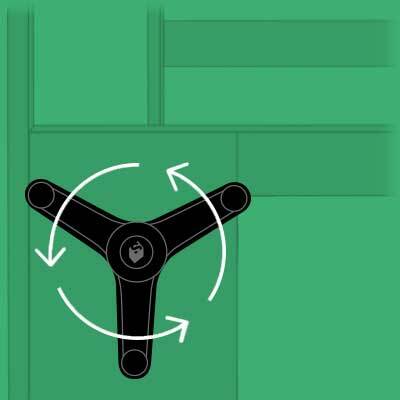 We offer two options to move tables and open aisles: mechanical-assist “crank” handles that allow users to move thousands of pounds with minimal effort, or powered systems that open with a touch of a button. Spacesaver’s factory-certified technicians will train you and your staff on the system’s operation. Integrate with your existing lighting, irrigation / fertigation, and other systems. Support existing tables / benches, shelving, or pallet racking. Maximize medical cannabis facility layout by going vertical with multiple tiers. Backed up by local space planning consultants and factory-certified technicians. 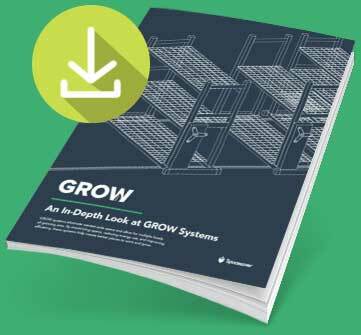 Learn about system sizes, safety features, and more in the GROW In-depth Guide. Download it for free and get the details. Calculations based on a standard industry table (4'x8'). Enter your room dimensions to calculate potential capacity increase. Our engineers are experts at accounting for all the variables (lighting, airflow, growing technique, ect.). Let them calculate your maximum potential. Go vertical for up to 4X the yields! Eliminate wasted space with GROW shelving systems to increase your capacity. Go vertical to boost yields by up to 4X with multiple growing tiers! Whether you have an existing space or are breaking ground for a new facility, we can help optimize your space to maximize your growing potential. Check out this grow floorplan for a 4,000 sq ft facility. It went from single-level static tables (approx. 1000 plants) to a high-density cultivation system (also called sliding tables or moving benches). By eliminating aisles and adding a vertical tier, the facility now produces more than 3600 plants in the same space. That’s a 360% increase! Our carriages can extend up to 60 feet. That’s 6 feet longer than any other mobile provider! We also go vertically up to 30 feet. That’s 8 feet higher that anyone else. As a custom manufacturer, we can design and build steel shelving, trays, and other accessories to your exact specifications. We can also work with your existing tables and shelving, lighting, and other systems to create efficient, productive rooms. Whether you’re moving into an existing building or optimizing space in your existing grow, your local Spacesaver consultant can help design the optimal commercial grow room setup for your facility. Spacesaver’s low-rise trays provide strength and durability with minimal maintenance. 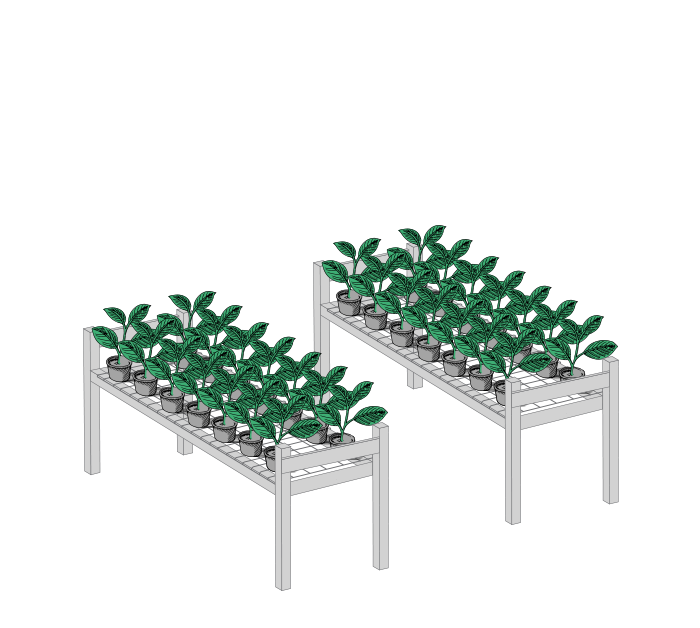 Designed to integrate with multi-tier GROW mobile systems and sized for a variety of standard tables, the trays prevent accidental run-off and promote proper drainage and airflow. They also fully integrate with any and all lighting and plumbing systems. We understand that credit is difficult to obtain in the emerging cannabis industry, and that’s why many of our clients install Spacesaver GROW systems in phases. By installing our systems one room at a time, or by installing the rails first and adding tables and shelving later, you can ensure an efficient transition to new, space-saving systems throughout your commercial grow or medical cannabis facility. Install systems in a single flowering room, and the increased productivity in that room pays for new systems in additional rooms. Start with floor rail systems during new construction. As funds become available, add moving tables to increase yields. 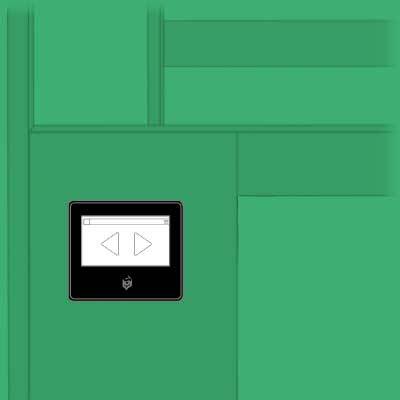 Boost capacity throughout any facility, including cloning and curing rooms. If you’re already working with a consultant or consulting team, we’re happy to work with them to implement your vision. If you’re looking for consulting services, we recommend the American Cannabis Company (ACC), which can provide full-service consultation and product solutions, from licensing and construction to cultivation, processing, and dispensing. This medical cannabis facility installed Spacesaver’s ActivRAC® Mobilized Storage System to gain higher yields. 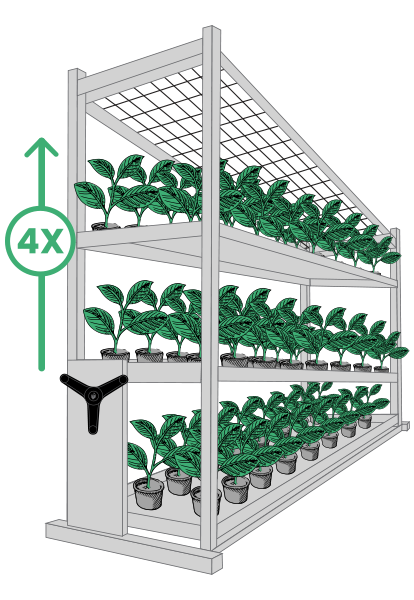 The grow room setup consists of multi-tier growing tables mounted on 42-foot-long “carriages” that move along rails installed along the floor. An ActivRAC was initially installed in a single room, and the increased yields in that room paid for new systems in additional flower rooms. In each case the local Spacesaver consultant worked with staff to design optimal floorplan layouts and minimize disruption and downtime, timing the ActivRAC installations to coincide with the end of each room’s harvest. Ready to maximize your yield? Contact us today to arrange a free, no-obligation site assessment. Our experts can identify where you can save space to maximize yields and take your commercial grow to the next level.